6162 Kanomax Hot Air Anemometer--the industry standard for measuring velocity of hot air up to 752 deg F and the instrument of choice for checking air movement in blast furnaces, smelters, annealing ovens, exhaust systems, chimneys and stacks. 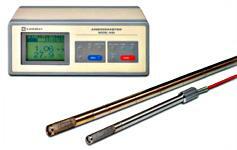 Choose from three interchageable high temperature probes for different applications and temperature ranges. Simulataneous display of velocity and temperature. On board memory stores your readings and the integral display lets you review data in graph form. RS232 download to your PC. The 6162 base unit and one or mores probes is required to make a complete system. Built-in RS-232 C serial interface for connection to PC. Printer Printing calculation results and measurements.